Crime tends to be our reminder of how important it is to know, respect, and look out for our all of our neighbors. Proactively we can combat crime by getting to know one another. This can start with a simple “Hello Neighbor,” and blossom into block parties filled with you and your neighbors for the “National Night Out” every August. In the present, we work to combat crime by being aware of our surroundings and using our gut intuition. We install bright lights, and security systems. If something seems a little “off,” it very well may be. Take note and let someone know. By doing this we are citizens taking active ownership of our neighborhoods. By taking active ownership of our neighborhoods, we can solve and work to stop problems before they happen. While the NOM for our neighborhood has been established, we very much need you, our citizens, our neighbors, our residents of Kingshighway Hills, to play an active role in taking ownership of your neighborhood. Please follow the link provided to learn more about what you can do to help keep our neighborhood(s) safe. The next Court Advocacy Training meeting will be held on Thursday, June 15th at 6:30 p.m. at Buder Library (4401 Hampton). This is right in our own back yard so if you were unable to make a previous training date, now is your chance! Unless someone like you cares a whole awful lot, nothing is going to get better, it’s not. 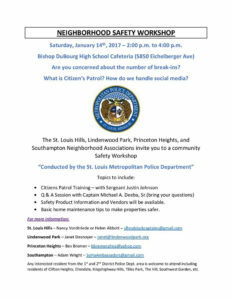 There will be a Neighborhood Safety Workshop on Saturday January 14th at DuBourg High School. All are welcome (and encouraged) to attend. Click on the flyer below for more info. There have been lots of social media posts recently about crime in our neighborhood. I’m not sure if we’re seeing a spike in actual crime, or if the crime reporting tools are getting better so we’re all just becoming better informed, but in any case there is something you can do about it. North Hampton* participates in the Circuit Attorney’s Neighborhood Ownership Model (NOM) program. At least on paper, we do. In reality we struggle to find committed volunteers – especially those that would be willing to take on any leadership or organizational roles. We have a police officer assigned to our neighborhood who tracks crime for us, and is a resource we can reach to if we have concerns. We are at risk of losing him as a resource because the participation in the NOHA NOM has been so low. The NOM is a program that at a minimum, tracks court cases for crimes in our neighborhood and lets us write an “impact statement” that is used with bail hearings or sentencing. It can be much more than that, though. We can make it into whatever we need it to be – but we have to have volunteers to get there. You can sign up here to get on the email list, and take on a role that needs to be filled. We need your help. *North Hampton is the Tilles Park and Kingshighway Hills neighborhoods. We’re in this together. The Kingshighway Hills Neighborhood Association is joining forces with Tilles Park Neighborhood Association to participate in the Circuit Attorney’s Neighborhood Ownership Model Program. What is the Neighborhood Ownership Model? The NOM is a program from the Circuit Attorney’s office that seeks to increase the level of active ownership that citizens take in their own neighborhoods. Criminals often target neighborhoods where they know that the crimes will be ignored, or the neighborhood is less likely to fight back. With tools from the NOM program, neighborhoods have more information on the crime that affects them, and also a voice in process when criminals are prosecuted. You can visit the CAO site to learn more about the NOM program. Why did we choose to partner with TPNA? The City of St. Louis does not recognize Kingshighway Hills or Tilles Park as separate neighborhoods. Officially, we are recognized together as North Hampton. There is also value to pooling our volunteer resources together, so a partnership makes a lot of sense either way. The NOM program starts with getting trained. The CAO office holds regular training sessions where you can be introduced to NOM resources and what you’ll be able to do as a part of the program. I want to help out. What do I do next? The first thing to do is attend a NOM training. The next one scheduled is Thursday October 1st, 6:30p at the Buder Library. You must RSVP if you are interested; you can do that using this online form. A white Jeep Cherokee was stolen from the 4900 block of Miami last night. If you thought you saw something suspicious in that area last night, or you have any other information to share, please contact the SLMPD at 314-231-1212. 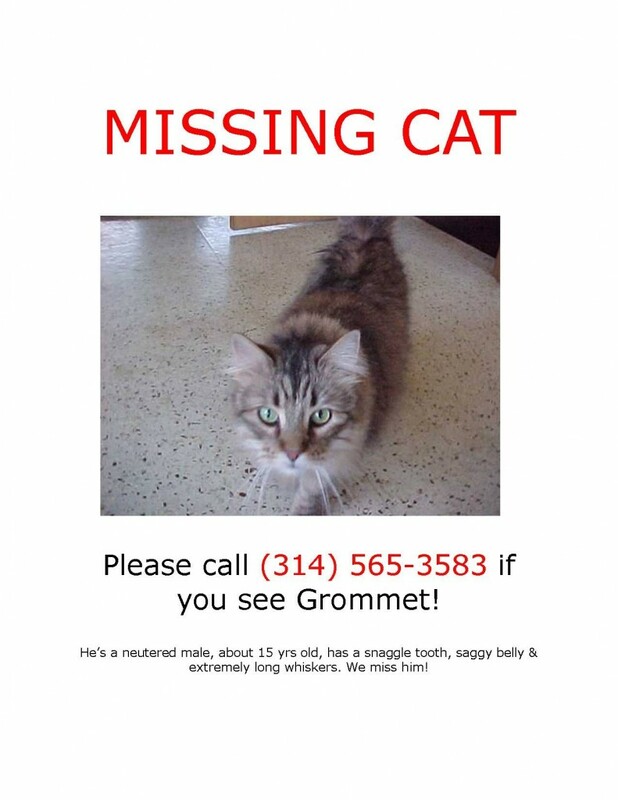 One of your fellow Kingshighway Hills residents has lost their beloved cat, Grommet. If you see him, please let them know! Three weeks ago, on Mother’s day, two friends stumbled upon a burglary in progress just outside of the SLU campus. They tried to flee when they realized what they were witnessing, but the criminals opened fire and struck 28 year old Laura. She is now fighting for her life. One of the organizers has lived in our neighborhood and attended Kennard. She appreciates the support of anybody that can make it out Saturday. The Fraud Prevention Task Force issued a warning about the Felony Lane Gang, a group that goes around stealing IDs & checks out of cars and then cashes out via a bank’s drive through. Protect yourself by not leaving your purse or wallet in your car, ever. Read the Fraud Alert from the Circuit Attorney’s office here. Car thieves have been targeting cars along Macklind Avenue, and the side streets off of Macklind this past weekend. Park in your garage if you have one, and report any suspicious activity to the police: 314-231-1212. KHNA has gotten word that there has been an increase lately in alley crime on Fyler. Items were stolen out of a car while the owner was unloading, a garage had some items taken, and a car was broken into. Remember that as the weather gets warmer, many of our alleys experience an increase in petty theft and car break-ins. These are often crimes of opportunity, so make sure you take steps to protect yourself and your belongings. 1. Thieves know you don’t expect things to walk off from your garage when you’re home, or even our working in the yard. Close and lock your garage to make sure the lawnmower and other tools stay put. 2. Don’t leave your car open when making trips inside to unload. 3. Get to know your neighbors. The more people you meet around you, the more likely you are to notice somebody in the alley who probably shouldn’t be there. Report suspicious activity by calling the SLMPD at 314-231-1212 (dial 911 if it’s an emergency). We will also post crime alerts on the KHNA site if you report them to us using the Contact Us link at the top of the page. Kingshighway Hills is in beautiful South St. Louis City. The boundary lines are Chippewa, Macklind, Fyler, & Kingshighway. Click image for larger map. Sign up for KHNA email updates! The mailing list is used to send out our newsletter and to announce special events. You won't ever receive more than two emails per month from us, and we'll never share your information with anybody else. Garcia Properties is a family run business located in Kingshighway Hills that excels at all things real estate. They're happy to help you find your next rental or purchase. Click the Garcia Properties logo to visit them.